When I bought a package of peat pots to start off my giant pumpkin seeds, I realized they weren't all that expensive (10 cents/pot) so I went back and bought a few more packages. Now I'm growing everything in them. The idea with peat pots is, when it is time to transfer them out to the garden, the plants hardly know they are being transplanted because they are planted with the pot directly into the soil. The plant's roots easily grow right through. Eventually the pot disintegrates, but I've heard peat pots can wick enough moisture out of the soil to kill the seedling so it is important to completely bury the pot. Left: Castor bean seedlings (Ricinus communis); Center: Echium pininana, Echium fastuosum, and Ecium wildpretii; Right: Carving pumpkins, Walking Stick Kale, Watermelon, English daisies, and Tomatoes. About a month ago, I took 10 Brugmansia (Angel's Trumpet) cuttings. All of them are rooting, and three of them are ready to be potted up today. 1. I cut off 1' long branches, making sure there was a node at the bottom of the cutting. 2. I trimmed off all the larger leaves to help minimize water loss (they wilted for about the first day). 4. I changed the water about once a week. 5. I waited for them to grow roots. 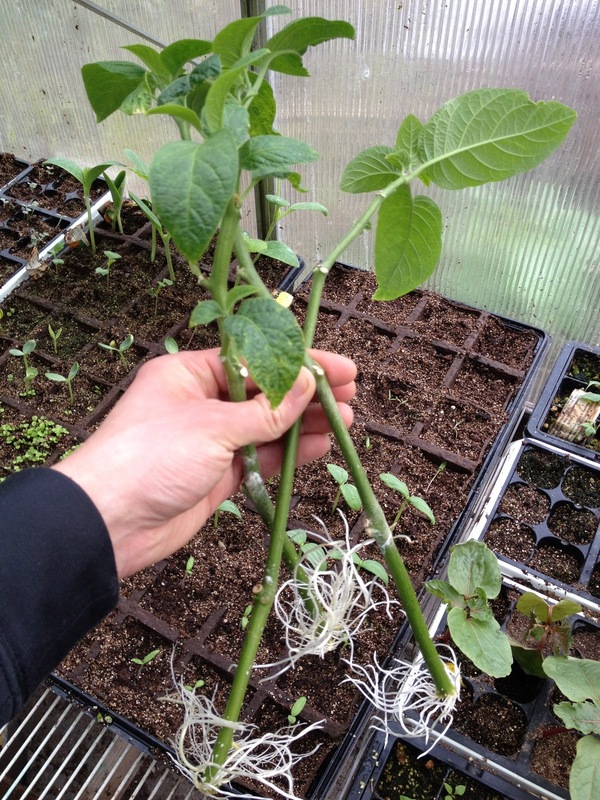 Once they got to the point where they had enough roots to be sustained in soil, I potted them up into 1 gallon pots. Finally, the potatoes are growing quickly after being planted just two weeks ago. I think the 60 degree temperature of the greenhouse is just about perfect for them. In Seattle, March comes in like a lion and out like a duck. The weather can be cold and rainy (like this year) or it can be mild and rainy with occasional warm stretches - even getting up into the 70s (not like this year). It's pretty much always going to be raining though. Luckily some sunshine has coincided with the weekend for once. Edgeworthias have the typical fragrance and small flowers of winter bloomers, but mine doesn't bloom until early spring. It's probably a Seattle thing. 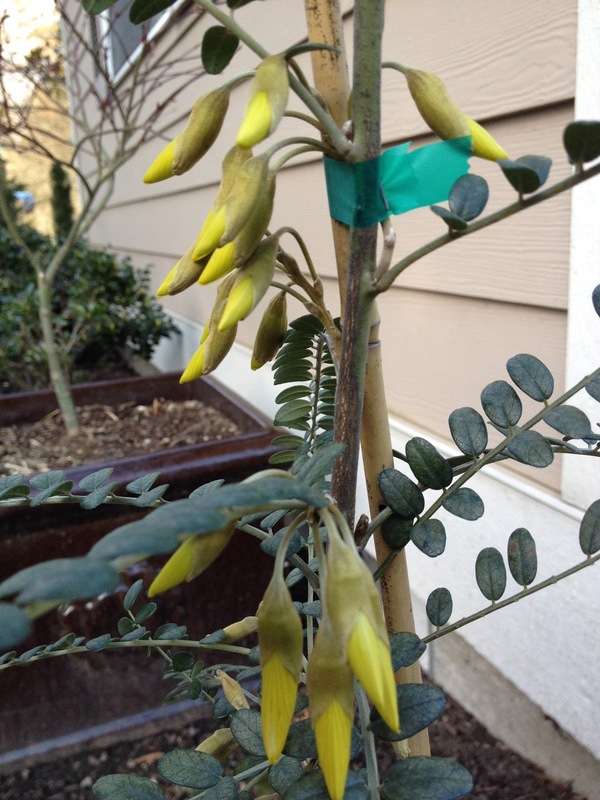 Speaking of going to seed, my newly obtained Sophora microphylla is about to bloom. I will most definitely be trying to propagate this plant. The Woodland Park Zoo in Seattle grows black locust trees around the African Savanna exhibit to mimic the acacias growing in the actual savanna, but they should be growing this tree instead! Glowing fuzz on the flower buds of Magnolia stellata (Star magnolia). And finally, this Primula vulgaris ssp. sibthorpii has been in bloom like this ever since Far Reaches Farm shipped it to me six weeks ago. Spring is the season when Alaska throws it's left-over crummy weather directly toward us. The only real difference from winter is a longer day length. Let's be thankful that is not easily changed. I remember a few years ago when March was half a degree colder than February. To top it off, mother nature occasionally teases us with a sunny day or two during the middle of the week - usually right before several weeks of constant rain and/or snow. But in spite of the cold and miserable weather, many plants continue to put on new growth. I don't know why or how they do this. 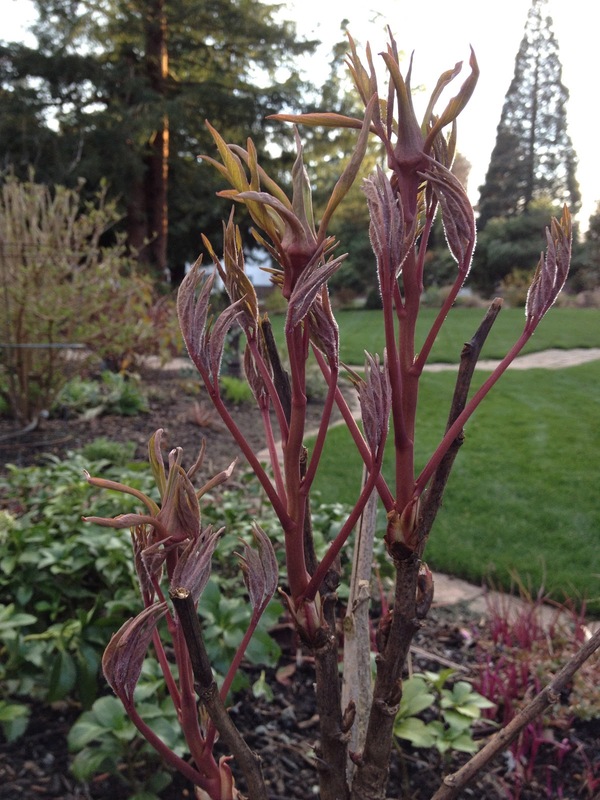 Above, Paeonia suffruticosa is already preparing bloom. Below, a patch of kale that was planted last summer in the vegetable garden is starting to bolt. The seed heads are actually not too bad tasting. I also planted some potatoes that I saved from last year. 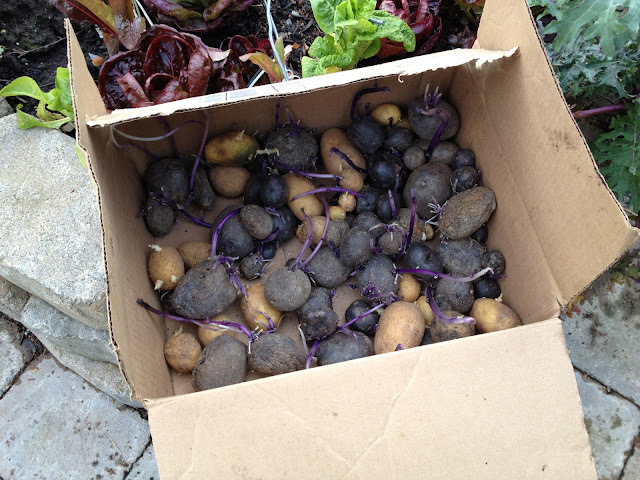 I dug these up in October, put the big ones in the refrigerator to eat, and stored the small ones in this box. I should have stored them in a box within a box so it would be completely dark since I discovered the smallest amount of light will trigger growth. The two varieties pictured here are Yukon Gold and Adirondack Blue. I also got some Adirondack Red potatoes a couple months ago and have already planted them in pots. Last year, I wanted to get the potatoes off to an early start so I did this technique which worked really well: I got several 3-5 gallon plastic pots, put about 4" of potting mix in the bottom, laid the potatoes in, then sprinkled another 2-3" of potting mix over the top to cover the potatoes. I then placed the pots in the greenhouse where the potatoes quickly started to grow. As they grew, I added more potting mix in the pots. 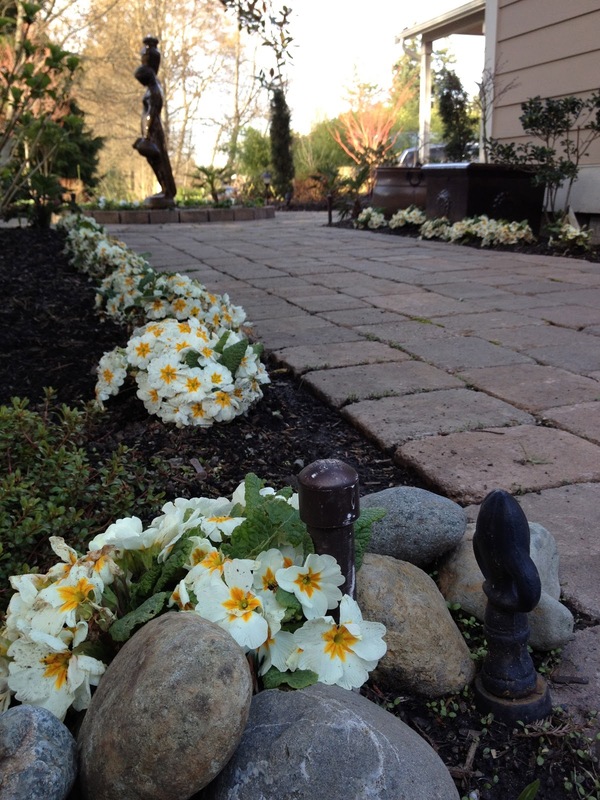 In early May, I planted them out in the garden. 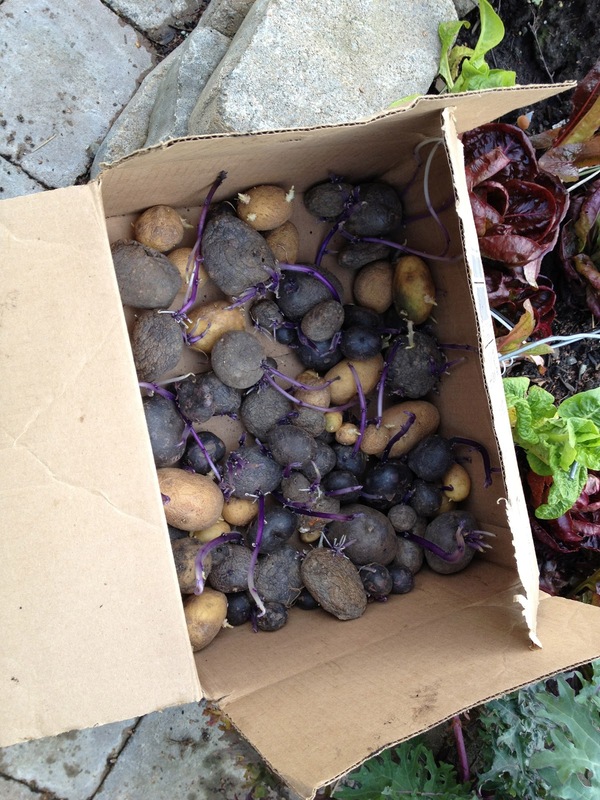 By the end of summer, the number of potatoes had increased tenfold. There are never enough seed trays at this time of year. Growing in the tray below, from left to right, are some red bell peppers, English daisies, watermelon, walking stick kale, and carving pumpkins. Also in the lower-right corner of this picture are three Berberis darwinii seedlings collected from the Arboretum. I just noticed this 80-pound rock on the sidewalk a couple of days ago. It's not stealing to take it, right? It would be a nice addition to the garden. It's on the sidewalk, and could be a potential tripping hazard. I should take it before anyone gets hurt. It's not really a field trip...I am lucky enough to live only a couple blocks away from Seattle University, where they have an incredible selection of plants growing throughout their 48-acre campus. 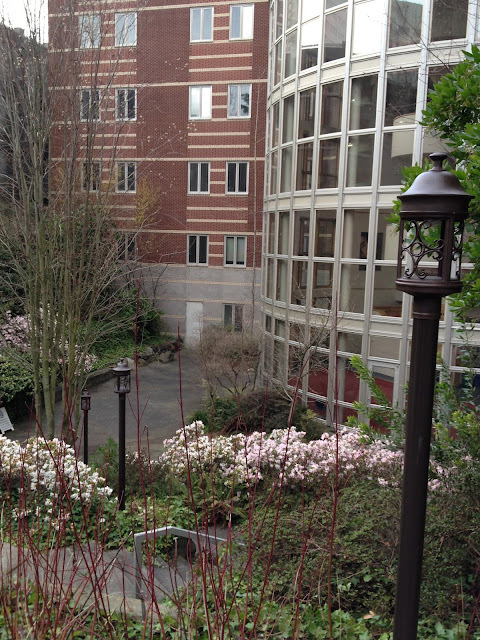 Above, an Akebia trifoliata grows on an arbor at one of the school's main entrances. Their selection of hellebores is fairly extensive. 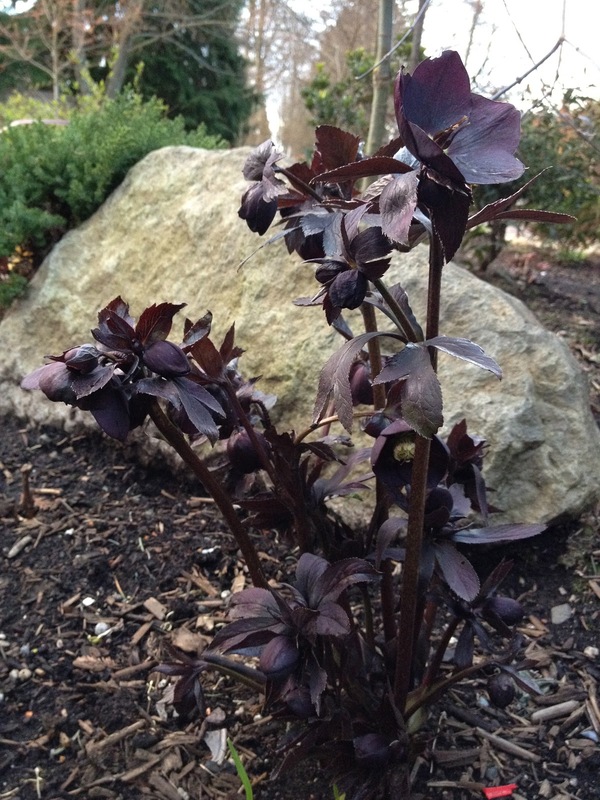 Above, clumps of Helleborus orientalis are growing to perfection. The evergreen leaves and red berries on Iris foetidissima give it a bit of a subtropical allure. 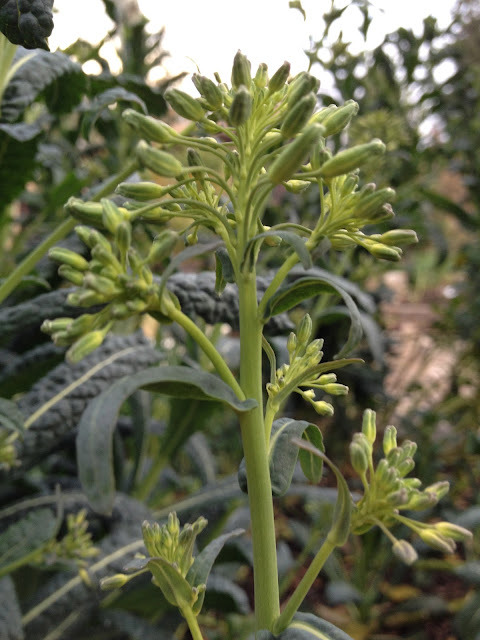 In the background is Acanthus mollis (Bear's breeches). Daffodils blooming three weeks before the end of winter! This might look like a grouping of 10-15 separate hellebores, but the light-green flowered hellebore in the center of the picture is growing from one solitary clump. It's giaganitc! I believe it is a Helleborus argutifolius. The Helleborus orientalis growing in the foreground is of normal size and shows just how big the other one is. They have several very, very large Hollywood Junipers (Juniperus chinensis 'Torulosa'). They are in fact skylights to an indoor corridor below, which makes this a green roof. Look at the size of those pine trees - not bad for being on a roof! There were a number of azaleas in bloom all throughout the campus. Finally, I was thinking how odd it was to have a rail going into grass, as if anyone needing a rail would want to walk around in the grass. But I'm now realizing this is probably some artistic symbolism. I thought the way the kept their grass with weeds and all was actually very attractive. I don't know why this Sorbaria sorbifolia 'Sem' has decided it's a good idea to fully leaf out with a good deal of winter still left, but I am grateful that it takes the risk. 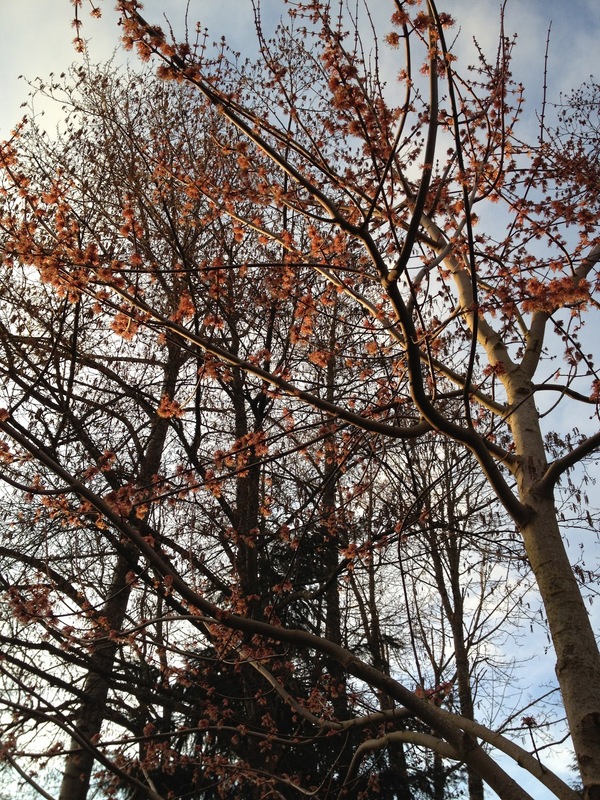 The red-tinged, translucent new growth glows in the sunlight, making this time of year its high season in terms of interest. By summertime it fades into just another old shrub. Euphorbias are such weird plants. This Euphorbia characias is starting to shoot its chartreuse suction cup stalks toward the sky. There is no such thing as having too many hellebores - especially black ones. 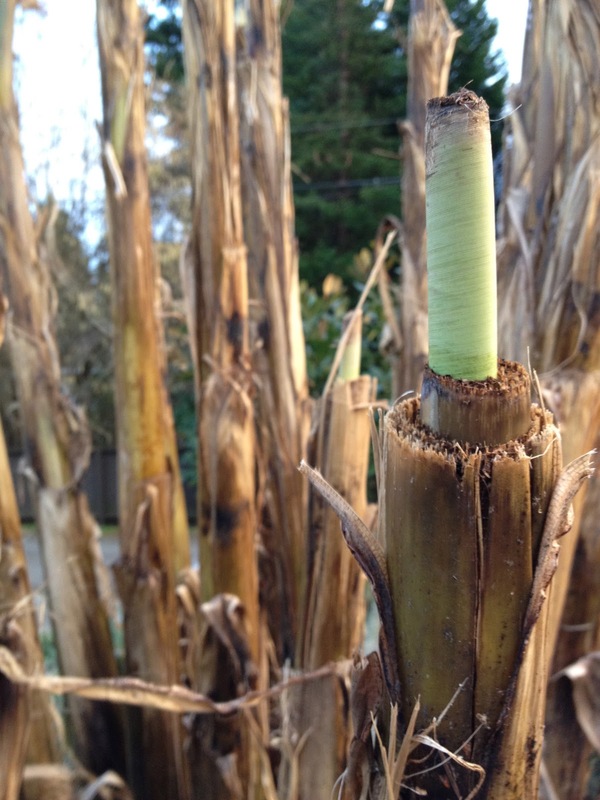 The cold-hardy banana (Musa basjoo) has sailed through this cold season without any protection. 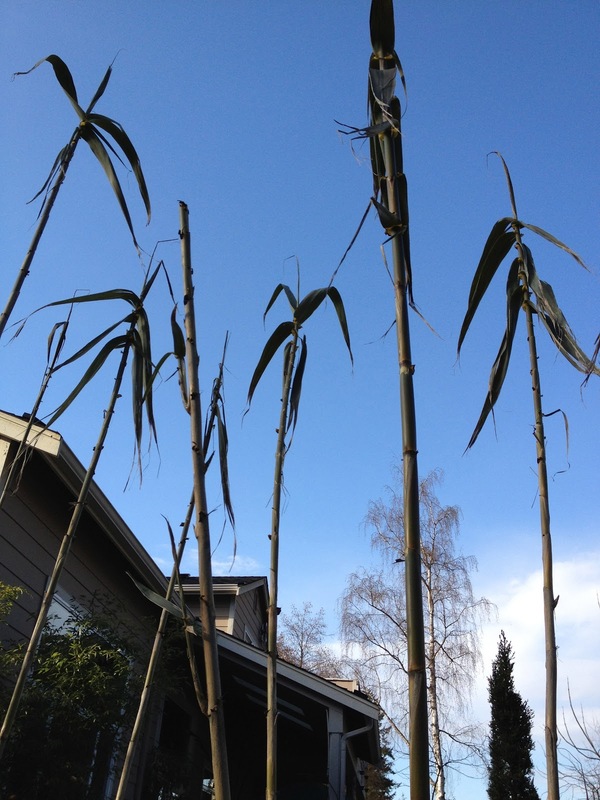 The pseudo-stems are currently about 10' tall, so I'm hoping they will reach their full height of about 20' this summer. Artichokes (Cynara cardunculus var. scolymus) make a great edible landscaping plant for us in the Northwest. They should be grown in the perennial border as opposed to the vegetable garden. The flowering stalks completely die down in the fall, but new rosettes of foliage resume growing from the roots and if the winter is mild like it was this year, they can be almost considered evergreen. 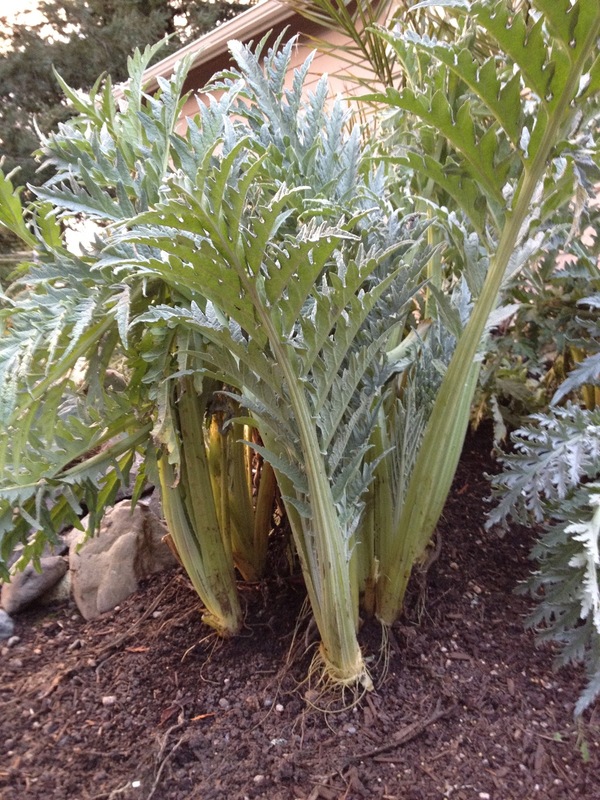 Few things grow as rapidly in our miserable March weather as artichokes. 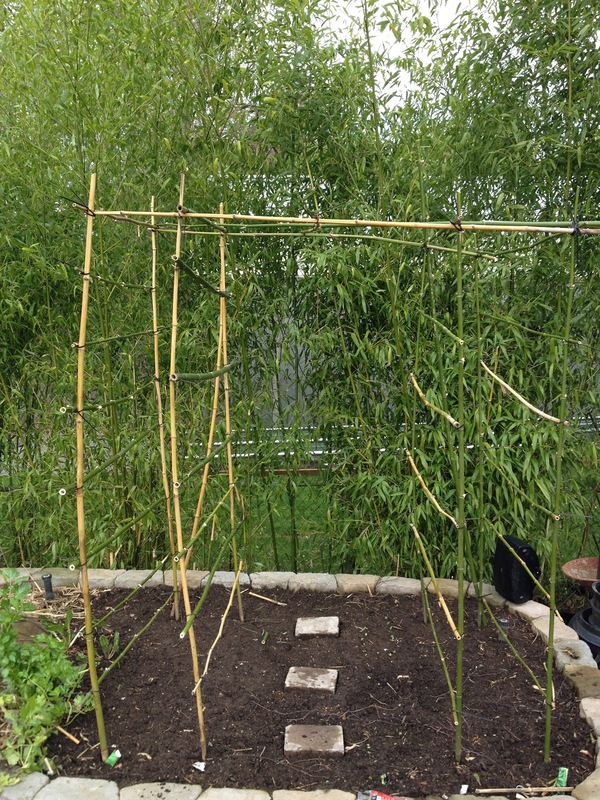 Here is my pea scaffolding. It's a bit wobbly, but anything made of bamboo and zip ties has to be indestructible, right? 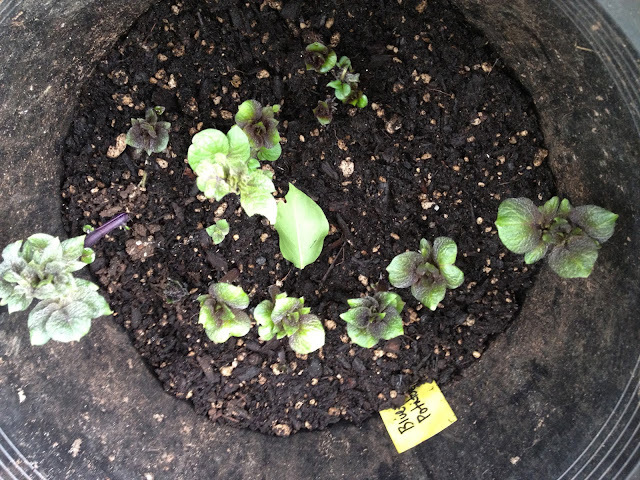 There are some radishes to the right of the stepping stones that have already sprouted. Finally, a shot of the rapidly emerging leaves of Cardiocrinum giganteum (Giant Himalayan lily). This will be its third year, meaning 3-5 more years before blooming. Thank you Far Reaches Farm...I can't wait to check out your nursery this summer!